Gordhan is currently leading efforts to shore up the country's debt-ridden state-owned companies, which have been hobbled by years of mismanagement. 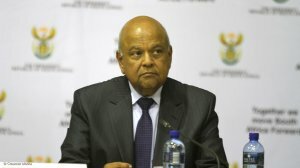 Public Enterprises Ministry spokesperson Adrian Lackay said on Thursday that Gordhan was not able to comment because he had made a submission on the investigation to a separate judicial inquiry into state corruption headed by Deputy Chief Justice Raymond Zondo and was not allowed to disclose that submission. "The Public Protector subpoenaed and is investigating allegations of impropriety against Minister Gordhan," said Oupa Segalwe, a spokesperson for the Public Protector. "It has been alleged that the minister approved Pillay's retirement and bought off his pension balance irregularly and later allowed him to be re-employed by the South African Revenue Service," Segalwe added. In an opinion piece in a South African newspaper last month, Gordhan said his efforts to clean up corruption in state-owned companies faced "dangerous" resistance which threatened the country's sovereignty.